This past weekend I was able to complete the 2nd frame rail. While I was not looking forward to trying to pick the old frame off the chassis jig by hand, my brother stopped by and helped me out. We pulled the old frame off the chassis table and put up the new frame rails. Next up, I need to build some cross pieces for the chassis table to locate and hold the frame in place. This will allow me to weld the frame crossmembers to the frame. Here’s some pictures of the progress. I’ve been working on building the frame rails since my last post on Thursday. I picked up the steel from Discount Steel on Wednesday, the day before Thanksgiving. I inventoried the order when I got to the shop and noticed that there was an error with my order. I sent Discount Steel my CAD drawing of the frame rail and it was broken down into two major sections, the front and rear section of a frame rail. 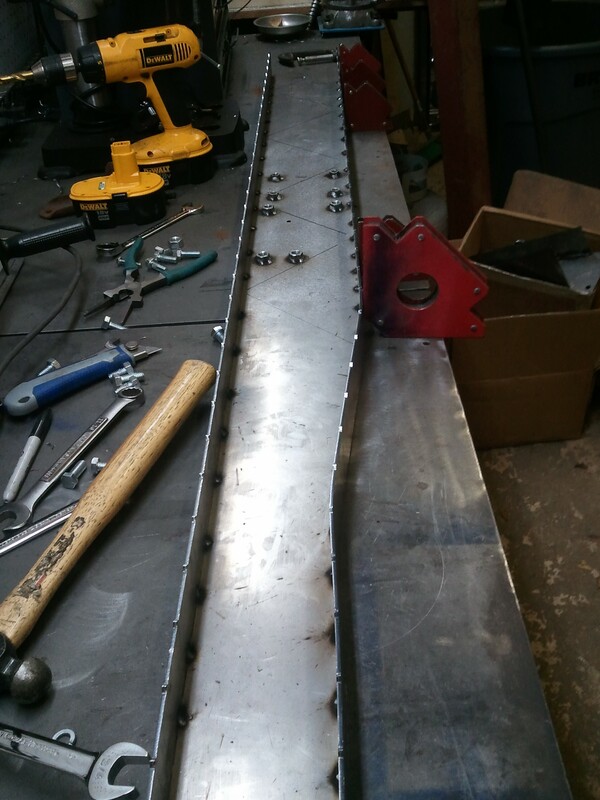 The frame rail is almost 16 feet long and it’s too long for their machine to cut as one piece, so I had to make the rail as a front and rear section. Each section has an inside shape and an outside shape. 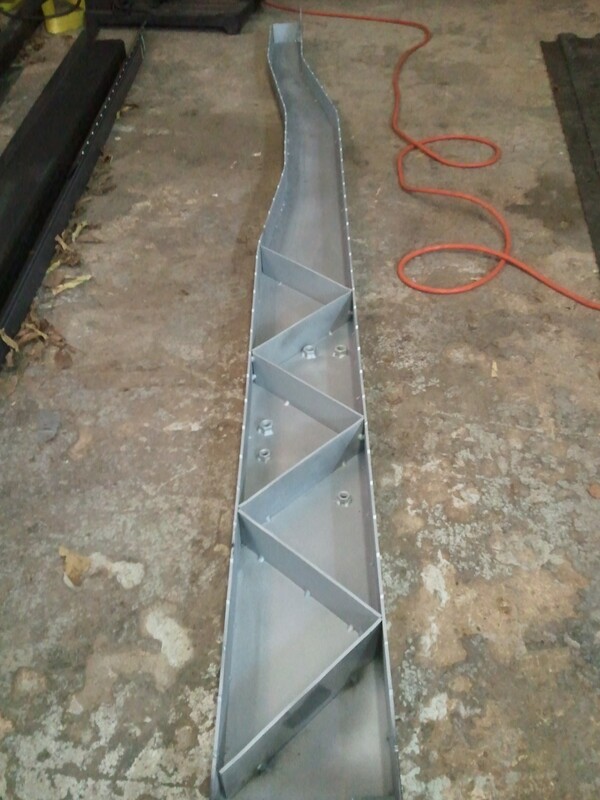 The outside shape has all the through holes for the frame brackets to mount to, but in my order I received 4 inside rear sections of the frame. Since I didn’t notice this until Thanksgiving, and they were closed on Friday, I had to wait until Monday to talk to them. In the mean time, I can get started on the front section of the frame rails. Starting with the outside shape of the front frame rail I first cleaned off any oil residue using some carburetor cleaner and then hit it with my Dual-Action (DA) sander. This puts a scratch coat on the steel and helps paint bond to it better. Plus it just looks better this way. 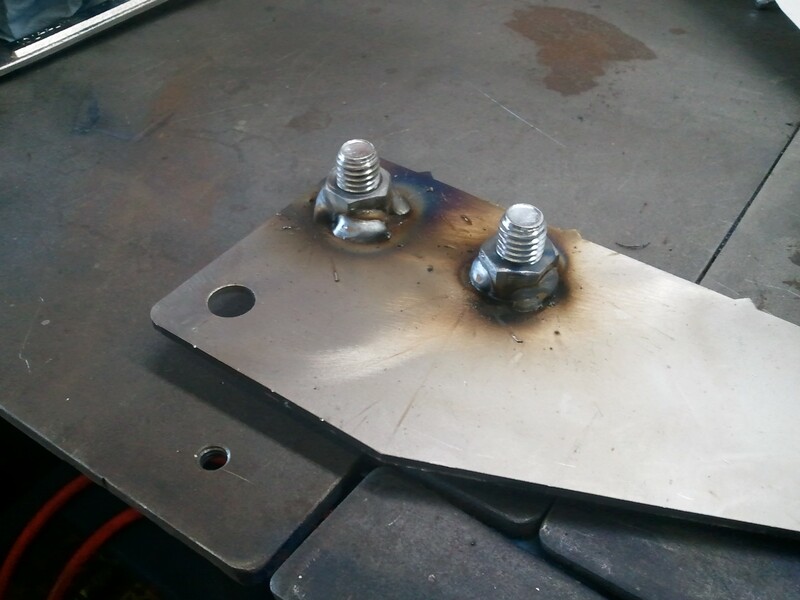 First task was to weld the captive nuts to the inside of the frame part. I realized after I welded the nuts on the frame, that I should have transferred some holes onto the outside part of the frame. When I’m building this frame I’m going to build a truss like structure between the two axles. This will help strengthen the frame where it needs it most. I drew this in my drawing as a series of triangles that are inside the frame between the front and rear axle center lines. Because this is inside the frame, I can weld the truss structure to the outside of the frame, but it’s going to hard to weld it to the inside since it would cover up the truss structure. What I decided to do was to cut out a series of holes where the truss structure would be visible. This would then allow me to weld the inside part of the frame to the internal truss structure. What I needed to do is to make sure the truss structure was in the proper location. What I needed to do was to transfer punch these holes from the inside part of the frame to the interior side of the outside frame part. Since I had already welded up the captive nuts, this took a little extra effort to get it done. 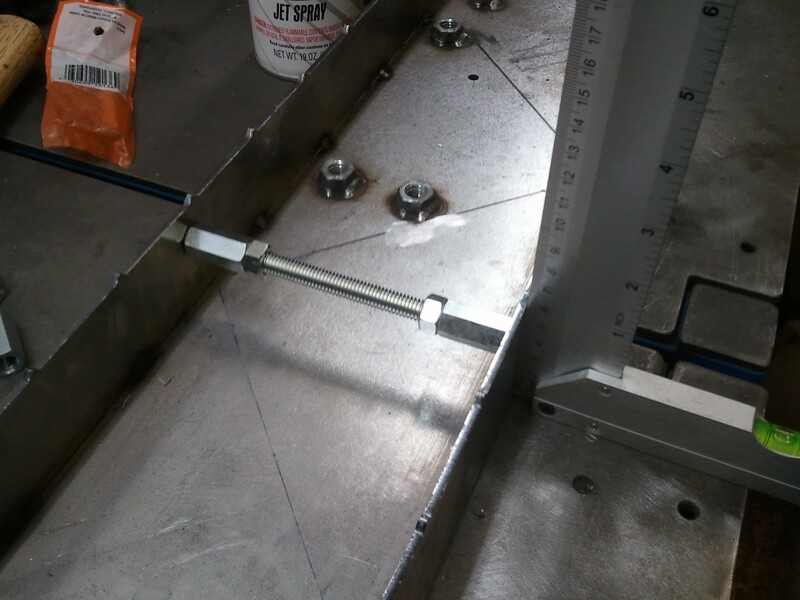 But before I could get to the internal truss structure, I had to weld the top and bottom pieces to the outside frame rail part. 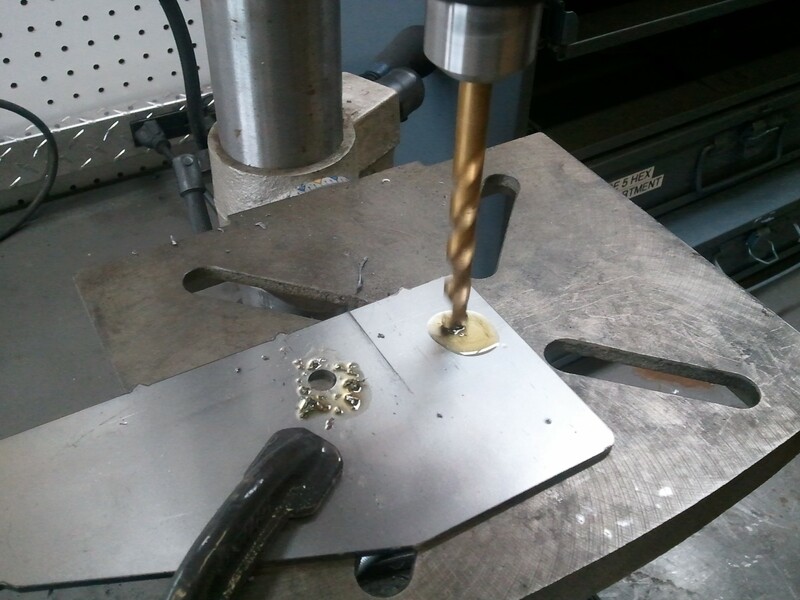 But before I could weld up the top and bottom pieces, I needed to drill some holes for the front bumper mount. 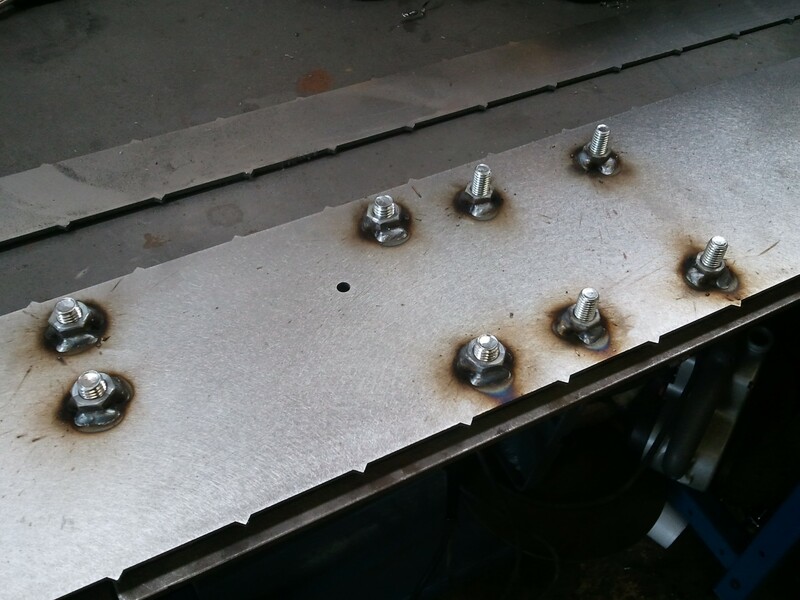 Two of the holes for the front bumper will be inside the frame rail, so I need to weld up some more captive nuts. 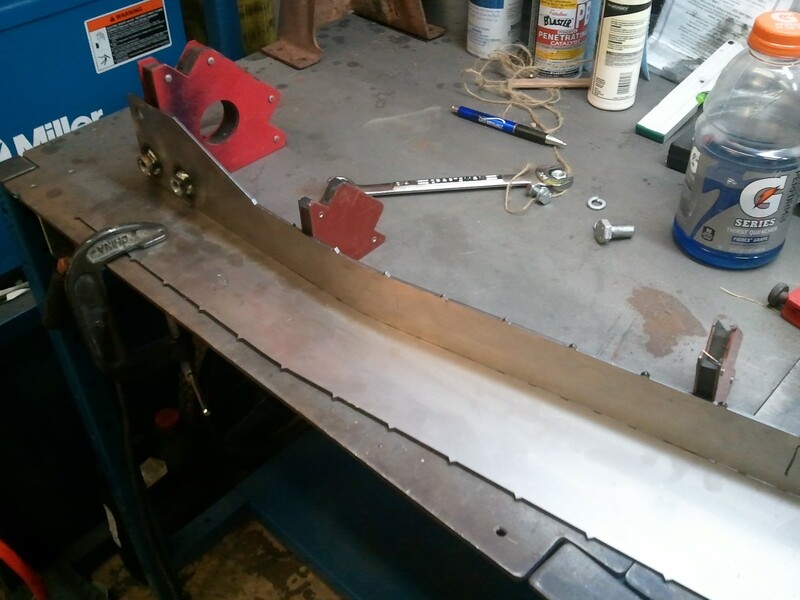 Now that I had to top part of the front frame section ready, I could start to weld it to the outside part. Top and bottom welded up. As I was welding up the top and bottom parts, I was having a hard time keeping the parts perpendicular to one another. Through the thickest part of the frame rail, it just be 6 inches wide. 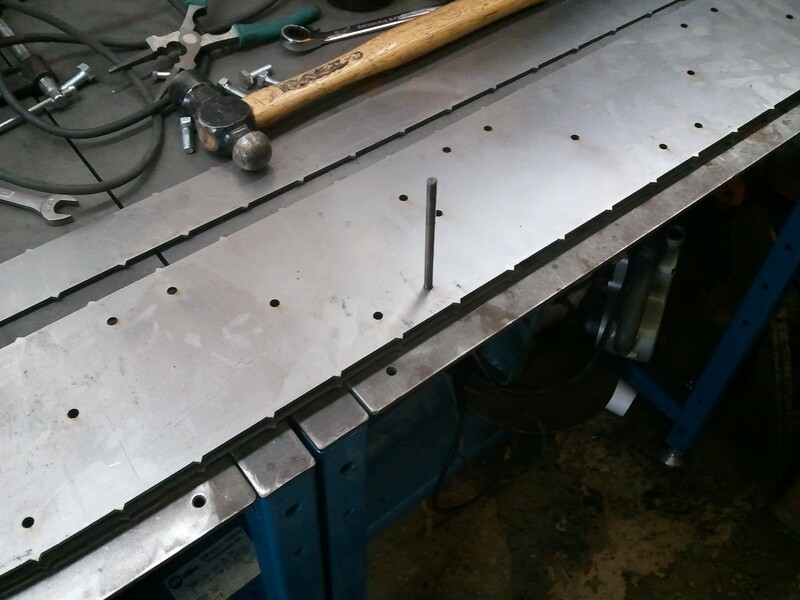 After I finished tack welding the top and bottom pieces I was about 1/4 inch off. I made up a little tool to push the sides away and then use the truss structure to help the frame keep its shape until the inside piece can be added. 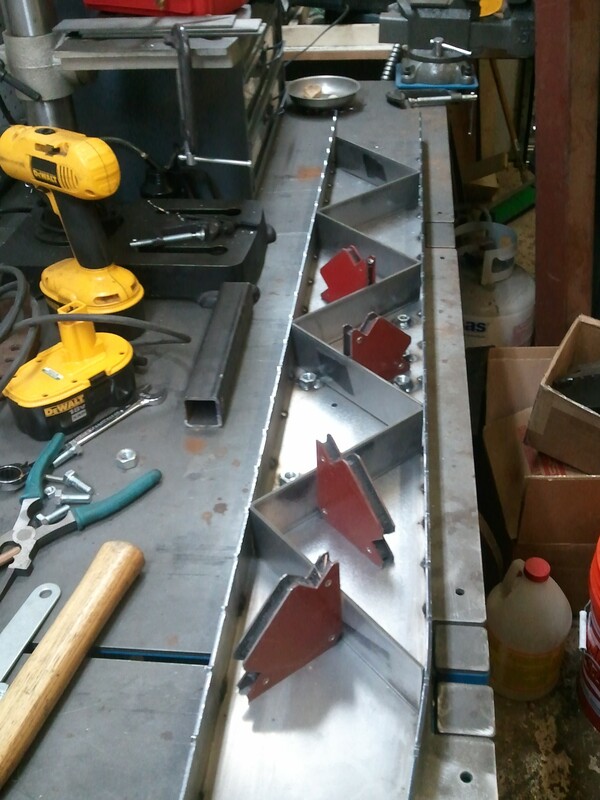 After I welded up the truss structure I gave it a coat of Weld Through primer.